This project was done as a nursery project, but really it's more of a project for a rec room/game room. I saw this pin on Pinterest a few months ago for a framed board game. It's a great idea for "functional art." 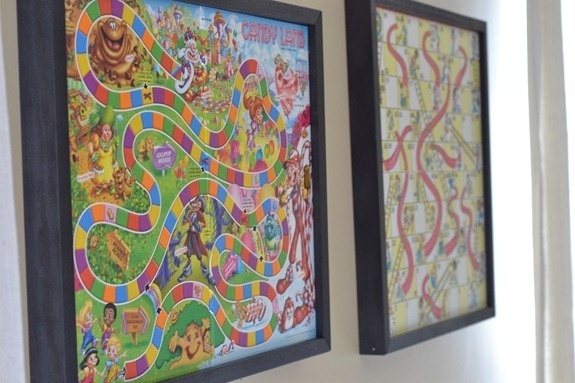 You just hang the game pieces behind the board and bam, you've got the perfect way to keep everything together in plain sight. I saw the pin, bought a vintage Clue board and then went read the link to see how to make the frame. Uh. I should have read the pin first. You have to actually cut the wood with fancy saws and stuff. (Okay, it's not that *that* fancy). It was much more work than I wanted to do with my cheap vintage board especially 8 months pregnant. So, the game board sat in the nursery for a month or so. I was at Hobby Lobby for a different project, and while in the canvas area, I saw a "make your own" canvas section. You buy interlocking wood pieces to make the frame and then wrap the canvas around it. Each "side" of the frame is pretty inexpensive at $1.60-ish a piece. I immediately thought of my frameless Clue board. I called my dad and asked him to look up the measurements of a game board. (This is what happens when you're the last person on Earth to have a smart phone...you end up calling your parents to Google things on a regular basis). He ended up measuring his and it was about 16x16. Well great, there were pieces that were just the right size. I took the pieces home and put them together. They interlock pretty tight, but I still did a dab of wood glue on each joint. I just had to paint, and I was done! I actually thought about staining the natural wood, but the project was in the "To Do" pile too long, and with baby was coming in a few days, I just used some acrylic paint I had sitting around. The paint job isn't my favorite...too matte and dull for my tastes, but I can always redo it. I knew I wasn't going to use the board for play, so I just stapled the game board right to the frame. So, here's my $6.00 game board frame! The board all stapled in. I made my own hanger out of string and staples..once again I was on a time crunch. Normally I would get an alligator hanger. Wood glue on corners (I use Gorilla Glue). Back of frame before adding in the game board complete with some art from my two year old in red pen.